At the moment (level 37) i have 45 Dex and will go for about 100. At the moment i have 100 Str and will increase it, after reaching 100 dex. Vitality is 50. Therefore now, i will go for 3dex, 2vit every level, until i reach something about 100 dex and 70/80 Vitality. After this i would go for 3 Strength (until end), and 2 Vitality until i reach about 250 Vitality. I am not sure what to do with Focus, since i dont have an ammy of rejuve/regeneration, but i would like to have one. what do you think? Note: I want more the solo/dps guide, cause i am leveling with a mate who is mage Therefore i think a dex build would be nice. But then the main question is, which skills are important with a dex build? Billybob wrote: At the moment (level 37) i have 45 Dex and will go for about 100. 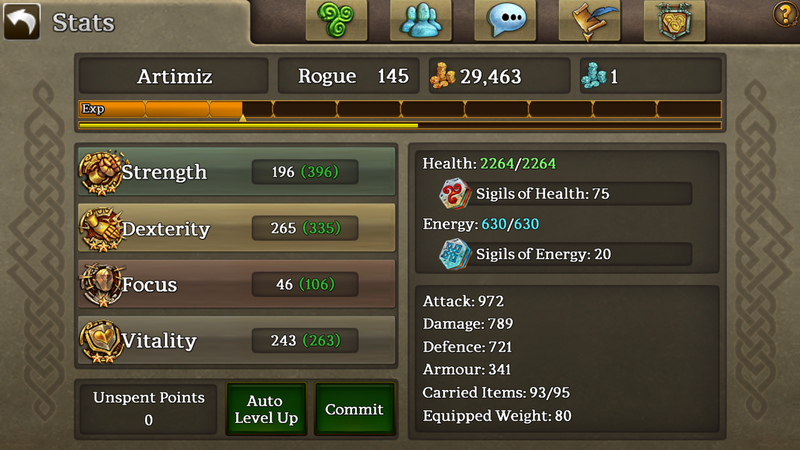 At the moment i have 100 Str and will increase it, after reaching 100 dex. Vitality is 50. Therefore now, i will go for 3dex, 2vit every level, until i reach something about 100 dex and 70/80 Vitality. After this i would go for 3 Strength (until end), and 2 Vitality until i reach about 250 Vitality. I am not sure what to do with Focus, since i dont have an ammy of rejuve/regeneration, but i would like to have one. what do you think? Lower level mobs are wimpy so you can gt away with less Vit but you will need to ad more as you get higher. Shalemont will test your Vit, the 3 stars hit fairly hard. Stonevale Druids will also test your Vit, and then there is OW. I was pretty clear on the original post about skills. KiyKiy wrote: Poison was pretty underwhelming; i have absolutely no idea where my idea of +130 damage came from. Thanks Kiy! Good to clear that up, lol. So those 'extra' Dex only gave you 12 more dmg for Poison. Which main hand weapom do you use again? Dagger or knucks? I really like the dex guide - nice and quick, simple but efficient. I look forward to trying it out. My current gearset is heroic haste gloves, gold venom offhand and heroic rejuv ammy, so I was just wondering which main hand to buy. Well I dont have a warden weapon yet (I have always been in drop hell, and got tried of camping), so I use diamond knucks. Since I dont use assasinate or sneaky I put all my points in quick and rend. The main reason I did this is because nobody else does. I wanted to try the unorthodox path. I like it but I do use a lot of energy in a fight My rejuv ammy is almost not enough anymore. At lvl 81, following ur advice will give me 240 vit, 100 dex, and 50 str(125 with my blade) is this too much vit? I understand its a soloing build but i feel that there isn't much dex when its called a dex build and not enough str to do much dmg. Plz give advice. And I use diamond dagger. Should I swap for knucks? Well it depends on what you are planning on killing. Tell you what. Put 160 in vit and dont allocate the last 80 points. Just save them. Go kill a few things see how well it works. Eat a couple pies to simulate having more vit. Try it out and see what the results are. Since you have the blade, dont put any points into STR and move the extra 45 points into dex. At one point i was leveling with a 300 Dex and 5 STR with a flaming offhand. So I have a rouge at lvl 146 but I want to change to a solo build since I solo a lot . So what do I need to do for dex solo build using this info . Please make a new topic if you want feedback for your build. This is an old topic.